One of the basic principles we work with is that warm air rises. As this occurs, the area below is left under slightly lower pressure, so there is a suction effect. 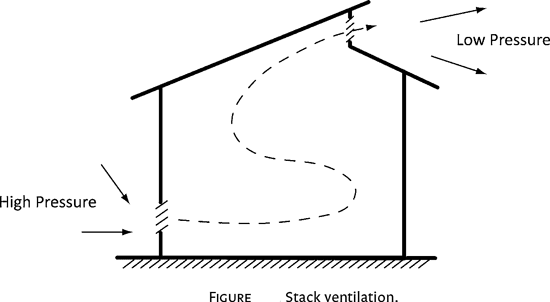 As the hot or warm air rises, windows located high on the opposite wall, or in an open upper-story area (like a stair-well, clerestory, cupola or monitor), can exhaust warm air out of the house while drawing cool breezes in. Any time we can use these passive ventilation strategies, we increase the velocity, and thus the effectiveness, of even the mildest breeze. Whole-house fans can intensify this effect. These devices are especially useful in areas where summer nights are relatively cool, exhausting warm air that builds up during the day and drawing in cool nighttime air for passive ventilation. If we can provide cool, comfortable air without having to use our mechanical systems, we save energy and money.